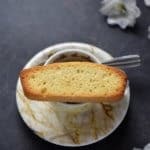 This post was originally published on May 2, 2015 and republished on February 17, 2018 with updated content, photos and more recently with a video (located in the recipe card). Thanks for watching and sharing! A recent conversation with a colleague of mine reminded me that I have a basic Italian biscotti recipe with no nuts. That’s right, no nuts! The perfect recipe for anyone with nut allergies …if you do prefer nuts, may I suggest my mom’s Almond Biscotti that are just amazing! So, as I was saying, this type of Italian biscotti can sometimes be referred to as “anise toast”. If the name sounds familiar, you might be thinking of the commercial brand made by Stella D’oro. The next logical question you might have would probably be if a homemade recipe for anise biscotti is any good, right? 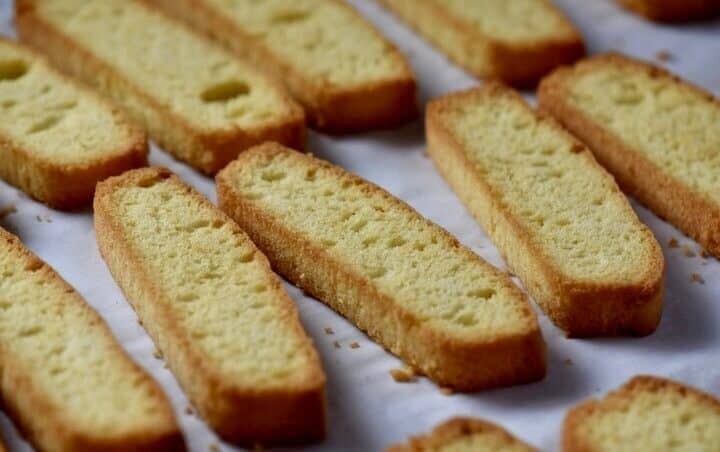 Well, these Italian biscotti are not too sweet, easy to make, slightly crunchy and crumbly. If you add more anise than recommended, the biscotti will even get a sort of licorice-type taste to it. It truly is one of my all-time favorites and I can’t believe I didn’t think of sharing it with you before today. When I make this biscotti recipe, I will usually divide the batter among three loaf pans. You might be wondering, why loaf pans? Well, once you make this recipe, you will quickly realize that this is not your typical Italian biscotti batter that needs to be rolled and shaped in a log. In fact, I would describe it more like a cake batter that can easily be poured into your pans. You can place this really soft batter directly on your parchment lined baking sheet, but be warned, they will expand to three times their size. Using loaf pans will give the biscotti a little height, which ensures less breakage. These anise biscotti are great even without the second baking. Once you remove the loaves from the oven, allow to cool slightly before slicing. 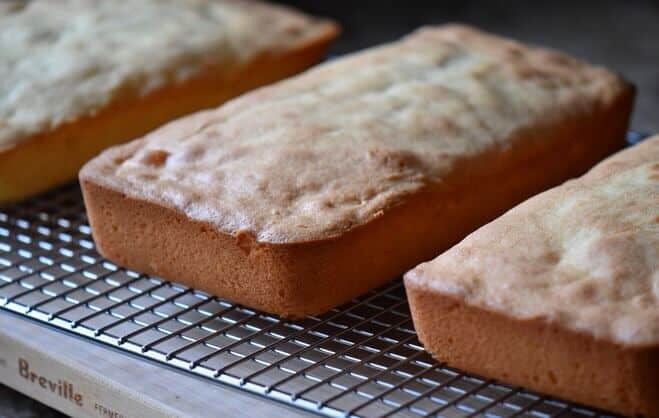 Once you do slice them, you will immediately realize that they have a wonderful spongy texture. 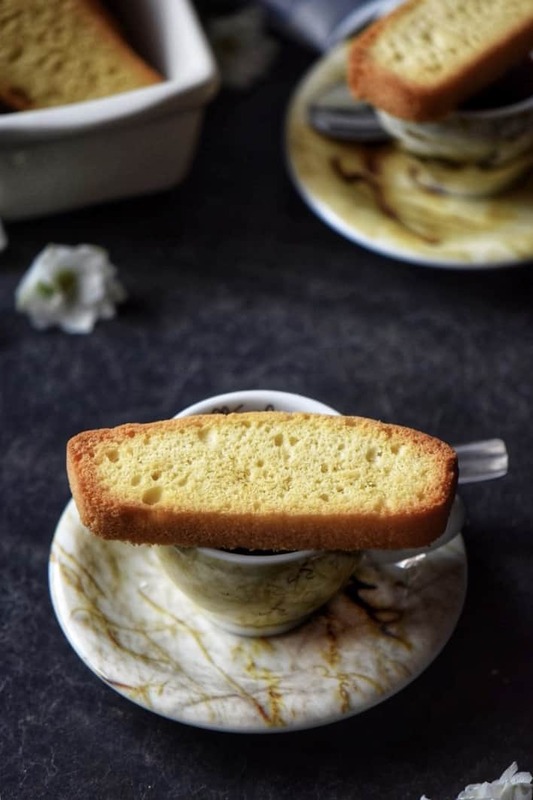 As with most biscotti recipes, if you prefer your anise biscotti to have a slightly crispy exterior, they need to be twice baked. 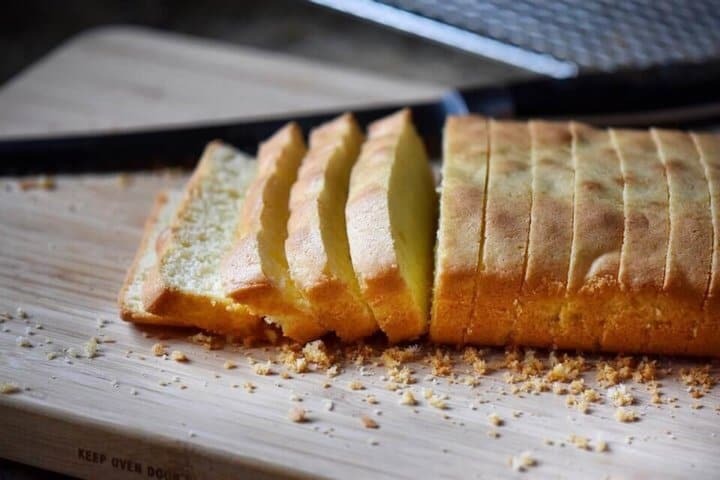 You will immediately notice that with the second baking, they become a little golden in color which will result in a little bit of crispiness. Please note that the longer they stay in the oven the crispier they get. Back to my Italian roots for this one! I have memories of my mom pulling these cookies out of the oven as we came home from school. And so, fueled with some homemade Italian biscotti and our parents’ good intentions, off we went to our rooms to study. No wonder it took me so long to share this recipe… who wouldn’t want to forget memories of homework! My Mom’s original recipe had 1 cup of sugar and 3/4 cup of vegetable oil. As you’ll see, I have reduced both with great results. Sometimes, I’ll throw in some lemon zest in the batter. It’s really up to you. 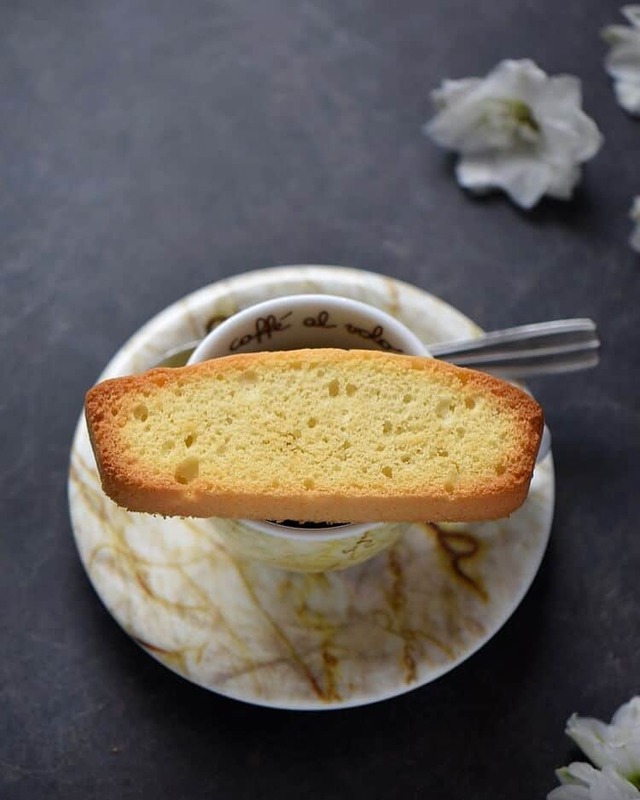 Authentic Italian Anise Biscotti from my home to yours…enjoy them with tea, coffee, espresso or a tall glass of milk. 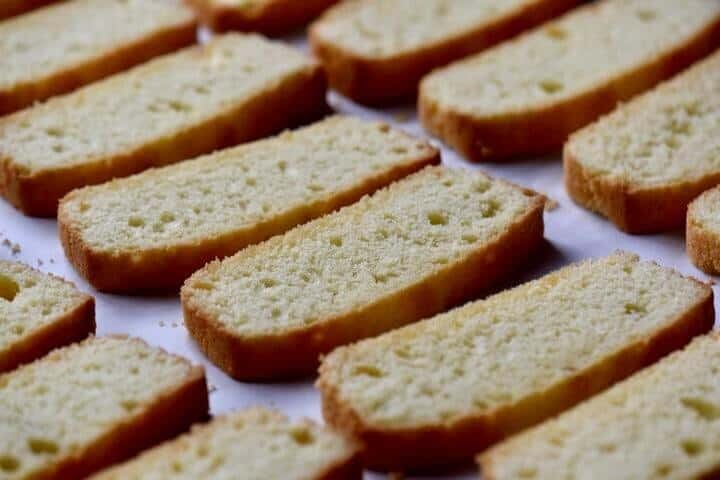 ★★★★★ If you have made these Italian Anise Biscotti, I would love to hear about it in the comments below and be sure to rate the recipe! 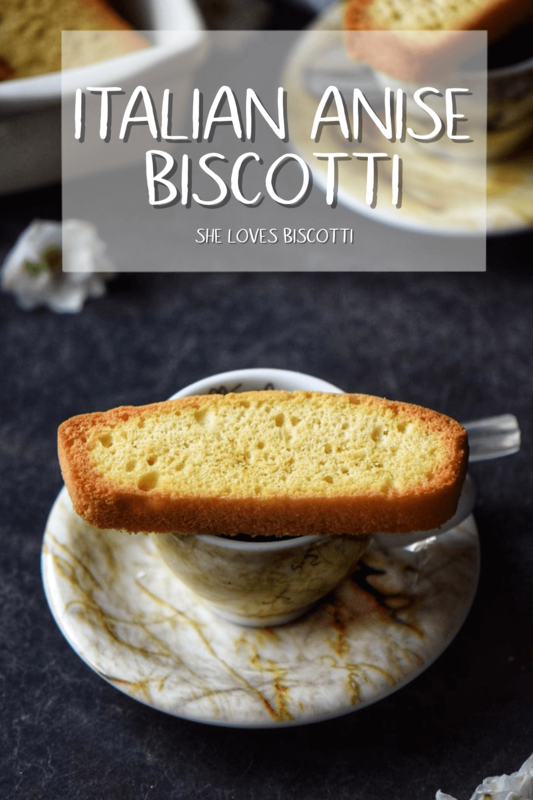 I think it's time for another Italian biscotti recipe! This family recipe will provide you with a texture that is slightly spongy on the inside and crispy on the outside. It really doesn't get any easier than this Authentic Italian Anise Biscotti. Preheat oven to 350° F (180° C). Position rack in the center. Grease and flour (or use non-stick spray) three 8.5 x 4.5 inch loaf pans. In a large mixing bowl, or bowl of electric mixer fitted with whisk attachment beat the eggs on medium speed until light and frothy (about 2-3 minutes). Add the sugar gradually and whisk for another minute or so. Add the oil and extracts. Whisk for another minute. Incorporate the flour mixture. Mix until combined. Pour mixture in the 3 prepared loaf pans. Remove from loaf pans and let cool for a few minutes. Using a serrated knife, slice cookies about 1/4 inch thick (or thicker). Place slices flat down on parchment lined baking sheets, and bake for about another 5-8 minutes or longer, depending on your personnel preference and your oven (the longer they stay in the oven, the crispier they get). Make sure to turn the slices over to ensure even toasting. Can be stored at room temperature for a few weeks...if they last that long. Please note that I will usually "fluff" my flour and then scoop. This is not your typical biscotti batter that you can roll into a "log" shape. The loaf pans help keep the batter confined. If using sheet pans, expect the batter to expand and the final shape of your biscotti will be longer and thinner, but just as tasty 🙂 Enjoy!!! Fantastic Beeso! Glad to hear this. Thanks so much for taking the time to comment, appreciate it. I made these this afternoon. They are awesome. I can’t stop eating them. They are nice and light and really yummy. Thank you for your recipe. It really didn’t take that long to make. I made a double batch. I used old metal ice cube trays and they came out great. They were a little higher than I expected, so the next time I make them I will use an additional ice cube tray. I got the ice cube trays at garage sales. They work out great. How wonderful Toni! Love the idea of using metal ice cube trays… brilliant! Yes, the only problem with these anise biscotti is that they are too good…lol Thanks so much for taking the time to comment, appreciate it!